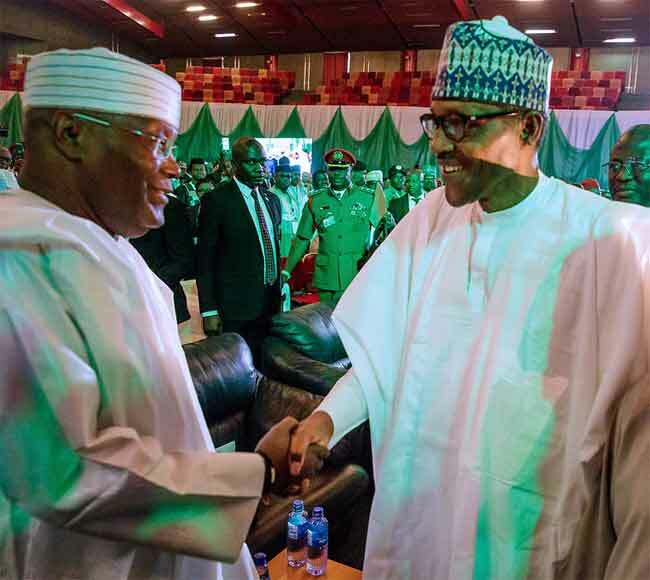 President Muhammadu Buhari, former Vice President Atiku Abubakar and other candidates have signed a second peace accord ahead of Saturday’s presidential election. The presidential candidates signed the agreement on Wednesday at the International Conference Centre in Abuja, the nation’s capital. Those who witnessed the signing included the Secretary-General of the Commonwealth, Patricia Scotland; former Head of State, General Abdulsalami Abubakar (rtd); Bishop Mathew Kukah, as well as other members of the National Peace Committee (NPC). Addressing the gathering shortly after the arrival of the guests, General Abubakar who is also the Chairman of the NPC urged political parties to function as effective actors for peace before, during, and after the elections. He also called on them to adopt a code of conduct that would promote a peaceful process devoid of rigging. The former Head of State asked the candidates to use the remaining days left to speak directly to voters and supporters, pleading with them to avoid violence. According to him, the importance of this is to ensure that there will be no need for Nigeria to invite foreign observers in the future. The Commonwealth Secretary-General, as well as former Presidents of Liberia, Tanzania and Botswana among others at the event give goodwill messages. On the part of the candidates, President Buhari of the All Progressives Congress (APC) called for prayers as the nation goes into the elections in a few days. The President who is seeking a second term in office also made an appeal to the youths to eschew all forms of violence. He stressed that the important thing was for candidates to accept the final outcome of the elections, noting that the Independent National Electoral Commission has assured the people of a free and fair exercise. In his address, the Peoples Democratic Party (PDP) candidate, Atiku, quoted former President Goodluck Jonathan, saying that his ambition was not worth the blood of any Nigerian. He, however, urged the electoral umpire to be fair arbiters for neutrality to prevail. Atiku equally asked security agencies not to embark on indiscriminate arrests of key officials, days or hours before the elections, saying that was the case in some bye-elections. He also urged the President to do everything within his power to ensure that the vote of every eligible person counts. All the presidential candidates had earlier signed the first part of the peace accord in December last year. President Buhari was accompanied to the signing ceremony by the APC National Chairman, Mr Adams Oshiomhole, and some top government officials. Similarly, the PDP National Chairman, Mr Uche Secondus and the Director-General of PDP Presidential Campaign Council, Senator Bukola Saraki, among other party leaders accompanied Atiku to the event.